Note that the blanket is large. If you are in doubt, please order a size smaller. 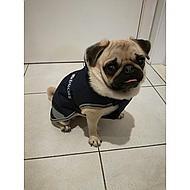 Very nice dog coat. Light weight and well reflective. My dogs always put their heads in their jackets, so a closed opening is no problem. Nice to attach and stays in place. Elastic not used. Jacket is also very cool because of the collar. Top! 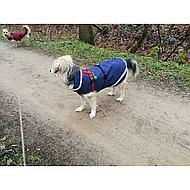 For my older dog who did not like to walk in the cold I was looking for a 'jacket' for him, I really recommend it because it fits perfectly! Only at the belly part you can adjust it. Very sturdy blanket that does not just break down. Also well waterproof. 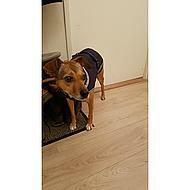 My dog is rather fussy and does not like jackets etc, but she likes them. It keeps her dry and warm and she does not suffer from it in her movement. I release the elastics around the hind legs, because they are quite tight and that is not pleasant. Even then the jacket stays in place. Answer: The blanket has no leg straps and is windproof. 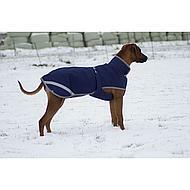 Question: I have a question about the sizes of the dog coats / blankets. How do you measure the size of the dog? Is it the length of the back? 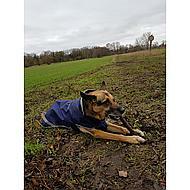 For example with the bucas freedom dog blanket? For example, is 45 cm the length of the back? 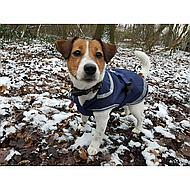 Answer: Indeed, the size of a dog coat is measured from the point in the neck where the collar is up to the beginning of the tail.